Highlighted by the first-place performances of Jessie Creed, Kasey Venn, Joelle Ohr and Vivian Wu, New Trier’s girls swimming and diving team claimed a decisive victory at the CSL South Meet at Glenbrook South on Nov. 4. Ohr finished the meet with four golds, including the 50 freestyle (24.46) and 100 free (53.48). The sophomore standout also anchored two winning relays, teaming up Wu, Venn and Audrey Richardson in the 200 medley (1:46.77) and combining forces with Venn, Olivia Lantry and Sophia Girgenti in the 200 free relay (1:38.52). Venn, a junior, added a win in the 100 breaststroke (1:05.23) and a runner-up finish in the 200 IM (2:10.46). Wu, a senior, took the 100 backstroke title in 38.25, while she came in third in the 200 IM (2:13.49). She also was a member of the winning 400 free relay team (3:36.94), along with Girgenti, Richardson and Ceola Halloran. Creed starred on the diving board. The junior tallied a 488.95 score. Sophomore teammates Katie Lipsey (397.35) and Maggie Seftenberg (387.65) finished second and third, respectively. Halloran, a junior, also contributed in the 200 free (2nd, 1:56.3) and 500 free (6th, 5:18.51). In addition to her work in the two relays, Richardson, a sophomore, helped the NT cause with a pair of seconds: 100 butterfly (1:00.17) and 100 back (59.53). Girgenti added a third in the 100 free (54.17) and a third in the 200 free (1:58.33), while Lantry placed third in the 100 breast (1:08.77). Other contributors included sophomore Charlotte Fondren (3rd, 100 fly, 1:00.56), freshman Greta Pelzek (4th, 100 fly, 1:00.77) and freshman Anna Werts (4th, 100 back, 1:00.58). Glenbrook South: The host Titans ended up third in the meet behind New Trier and Evanston (359 points). 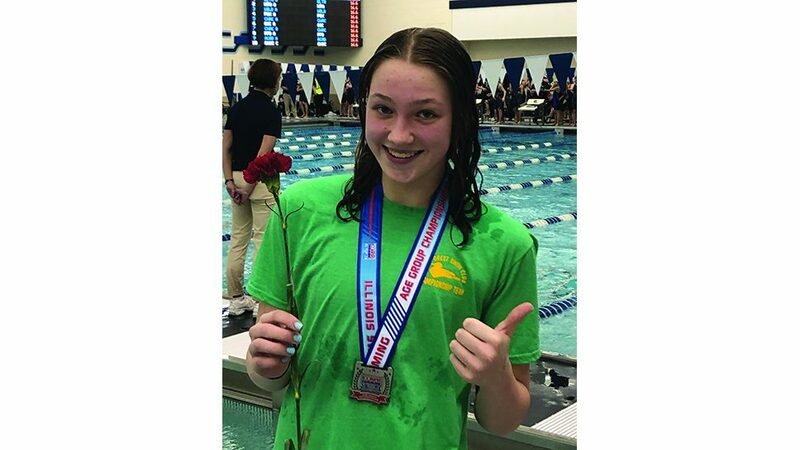 Top efforts were turned in by sophomore Alexis Kachkin (3rd, 50 free, 24.97; 5th, 100 free, 54.61), junior Kate Solem (5th, 500 free, 5:17.72), junior Nomun Saintur (5th, 200 IM, 2:16.03), junior Catherine Devine (5th, 50 free, 25.21) and junior Alex DiMarco (6th, diving, 340.60).